This failed effort in my first go at one of Henderson's offal recipes might not deter me from continuing on to kidneys, hearts, and sweetbreads, but it certainly will put me off of cooking tripe for the rest of my life. H says to simmer in a mixture of milk and onions for about an hour and he cautions against overcooking. Tripe will just melt away, he warns. But other sources caution the opposite: it might take twelve hours to transform these strips of the lining of the ox's second stomach into something easier on the teeth than bungees. After about twenty minutes of simmering the kitchen already smelled as Waverly Root warned it might, like boiling laundry. (Strange that it should have such an objectionable odor while at the same time having no discernible flavor.) My queasy disgust was a flashback to how I felt when I watched The Cook The Thief His Wife and Her Lover, which I saw very soon before becoming a strict vegetarian. After two hours and twenty minutes, the little piece I cut off to taste was perfectly inedible. Rather than continue to simmer for nine more hours--I was too nauseous from the smell to contemplate nine more minutes--I tossed the whole mess in the trash. 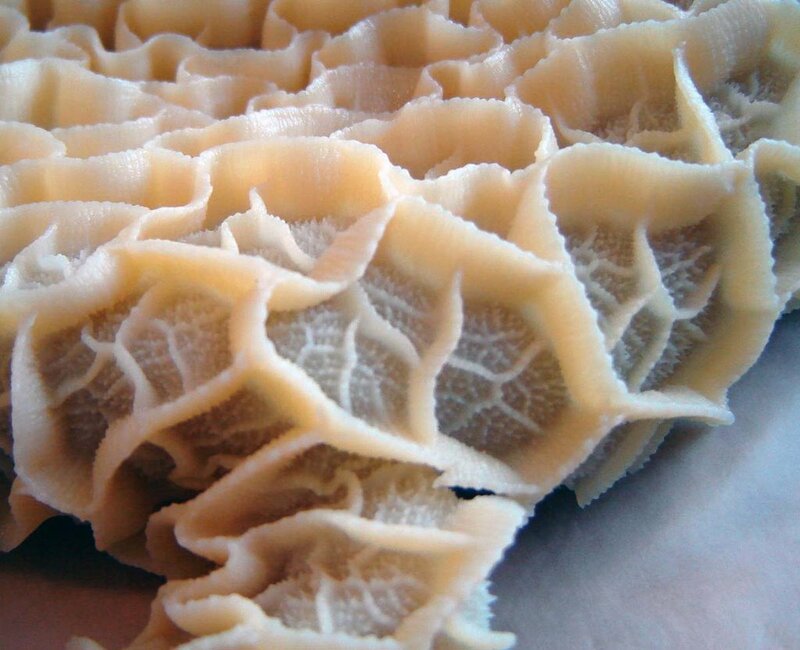 On the upside, tripe is undoubtedly the most photogenic item in the meat section of the supermercado. Have you had steamed tripe in black bean sauce and garlic for dim sum? On my trip to Hong Kong in Nov last year, I saw it and ate it for the first time. I thought it a really pretty food. It was crunchy and so tasty. I'm going to eat it again no matter what. 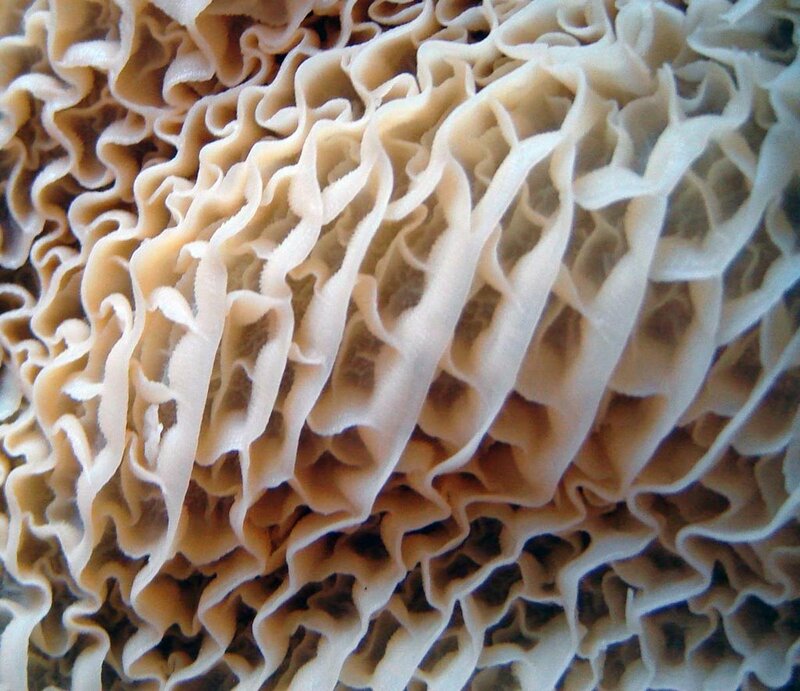 I love tripe but it an acquired taste. Wonderful photos though. It looks like laundry, too. In a string bag. Many years ago I made some tripe dish that took forever. Neither spouse nor child would touch it- and they were pretty adventurous eaters. I liked it, though I don't remember what it tasted like. As I recall, tripe is more of a texture food than a flavor food. With the black beans and garlic to flavor it for dim sum, it is probably quite good. I haven't had dim sum tripe. I have had beef tendons, though, another texture food. I'm not wild about them. 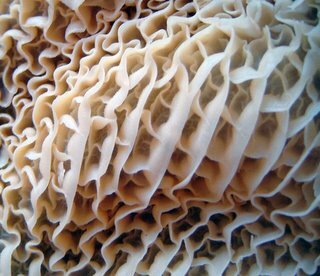 I would be happy to eat tripe as long as I don't have to stand around the kitchen while it cooks. Barbara, my sources confirm your recollection re flavor. They say basically that people eat tripe as an excuse to eat mustard or whatever other things people put on tripe that they wouldn't have all by themselves. I feel like if you have to cook it for that long, it probably doesn't want to be eaten. Then again, humans have had to try eating...everything. Beef tendon = [shudder]. I've never liked it, although everyone else in my family is fine with it. It's just texture, and not a good one at that. The Cook, The Thief, His Wife & Her Lover is a movie I hope to neeever ever have to watch again. Wonderful photos. I especially like the second from the top. Wow. 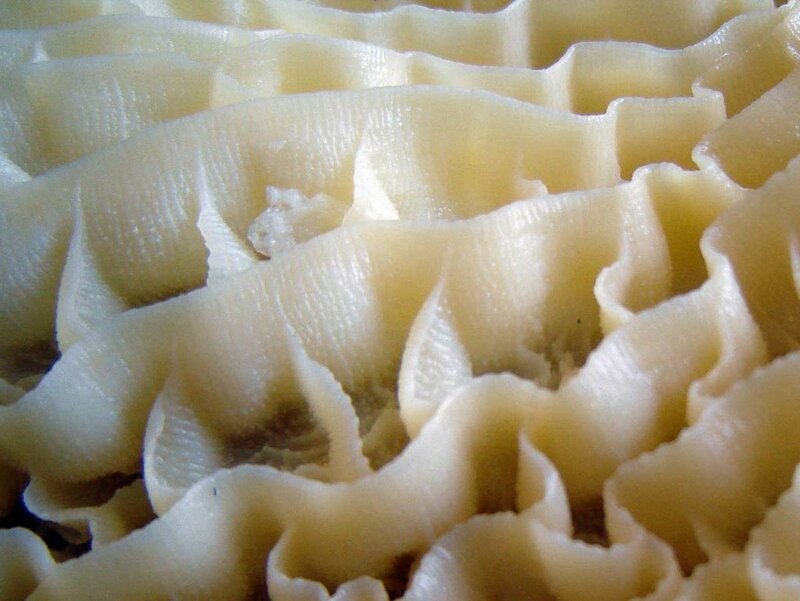 I can't believe you managed to make tripe BEAUTIFUL. Those pictures are fantastic. 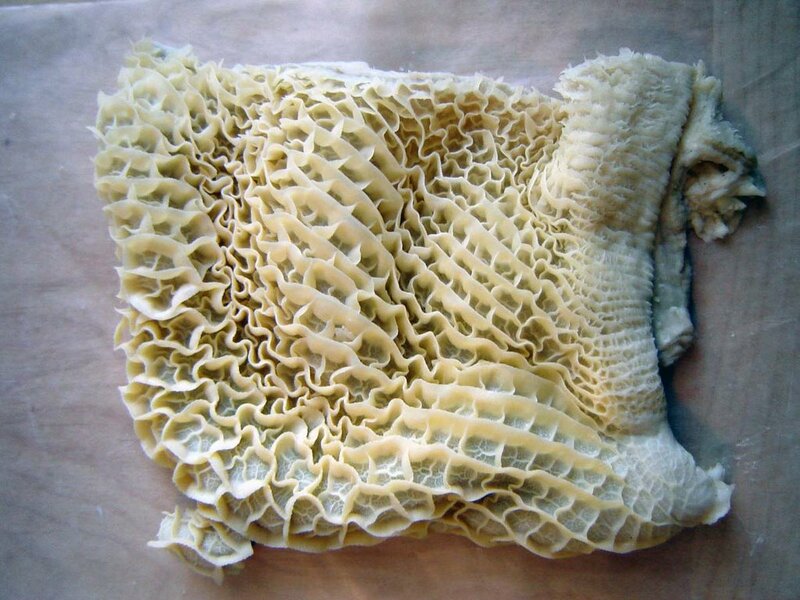 Whenever I'm at the store and see tripe I get a bit queasy. Reminds me of the time I went to a sold food restaurant in far West Chelsea sometime in late 1970's. I wanted to get down with the real Peeple, you know, and ordered chitlins. The waiter must have asked me 3 times if I was sure. They served it with a big bowl upside down covering the plate, the reason for which was obvious when I lifted the bowl and smelled what I had ordered. Needless to say, I sent it back, suffering the snickers and snide glances of the wait staff. I meant to type : "SOUL food"
Chitlins are not for the faint at heart. My area of expertise is soul food and I refuse to cook chitlins, tripe or make menudo for all the reasons you all describe. Hats off to you for trying. While I am not usually a proponent of strict rules in any culinary matter, I believe that never mentioning The Cook the Thief His Wife and Her Lover on a food blog might be a rule I could wholeheartedly support. Now I'm going to have to go home and watch Tampopo to get my appetite back. I can't decide whether to be put out or grateful. How much are those bagels in the window?